Check out this story on CNN when you get a chance. It's about Brad Blauser, a Dallas native who founded Wheelchairs for Iraqi Kids. Since 2005, he has been provided hope to hundreds of disabled Iraqi children and their families through the distribution of pediatric wheelchairs. Last Friday, we launched our new website. The new design is much cleaner and easier to navigate, and so far has generated rave reviews from its visitors. While the format has changed, much of the information has remained the same. You can also still purchase your Gala tickets or make a donation directly from our website. Click here or the screenshot to check it out for yourself and let us hear your feedback. If you have any comments or suggestions, please email them to Mike Phelan or just leave them in comments. Thanks. Thanks again to everyone who made it out last Friday to the Hall of Mayors for the ADA Celebration. We had a great turnout and the feedback so far has been great. We had speakers from various local organizations that spoke about what the ADA has meant to them and how we can continue to build on that framework for the future. Some pictures of the event are below and you can view more of them here. If you were able to make it down, we'd love to hear back from you about ways to make it better for next year's 20th anniversary. Give us a call at (901) 327-2473 or send an email to mphelan @ arcmidsouth -dot- net. Open House at The Arc! Come join us for an open house celebration! You’ll get to see our newly renovated space, including the revamped Resource Library. You'll also get an inside look at what we do each day to improve the lives of citizens in the Mid-South with disabilities. Wine and hors d'oeuvres will be provided. Plus, if you bring a friend, you’ll be entered into a raffle to win a pair of tickets to our Arc Benefit Gala on September 26. For those of you who have never been to our offices, we're at 3485 Poplar Avenue in Suite 210, which is the southwest corner of Poplar and Highland. Hope to you see then! Just a programming note for everyone, The Arc of the Mid-South will be featured on the August episode of Memphis Makers, a show on the Library Channel in which host Ally Luciano talks with representatives of Memphis area non-profit agencies about the services and activities they provide to the community. Carlene Leaper, our executive director filmed the show last Wednesday and it will air all during the month of August. She talks about the missions and visions of The Arc as well as our upcoming 14th Annual Arc Benefit Gala. Hey everybody, click on the flyer below to get some more information about the upcoming Volunteer Advocacy Project. This is a fantastic training program for individuals who are willing to become advocates for families as they navigate their way through the world of special education. If you are interested in participating, you can download your application from our website. 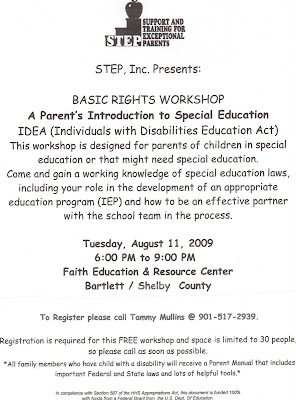 Support and Training for Exceptional Parents (STEP) is hosting a basic rights workshop on August 11th at the Faith and Education Resource Center in Bartlett. See flyer below for more details. Mid-South Paralyzed Veterans Association, and United Cerebral Palsy(UCP) of the Mid-South. We'll have free lunch for all the attendees as well as Memphis and Shelby County ADA Report Cards, Music, and more. We have several speakers on tap for the event including Gary Vanasek from the Department of Justice, Dora Ivey from the Aging and Disability Commission, Marianne Finley from the Disability Law & Advocacy Center (DLAC) of Tennessee, Suzanne Colsey from People First of Tennessee, Florence Hall from the Disability Advocate Center, as well as representatives from each agency. Best of all, we're indoors this year! It should be a great time and celebration of 19 years of the ADA. We hope to see you there. For more information about the event, please contact Randy Alexander at MCIL at (901) 726-6404 or by email. It was good to see everyone at AutoZone Park! A sincere thank you to every one who bought tickets to the Redbirds game last Friday night. We had a great turn out (more than 100 tickets sold) and received additional donations from many of you as well. It was great to talk to many of you at our table in the courtyard before the game and answer some questions about the work we do. Don't forget that we've begun collecting sponsorships and auction items for our 14th Annual Arc Benefit Gala coming up at the end of September. If you'd like to contribute, please contact Eugenia Murphy at (901) 327-2473 x503 or email her here. Community Partner Night is next week! Our Community Partner Night with the Memphis Redbirds is almost here! It's next Friday - July 10th - at 7:05pm when the Redbirds host the Albuquerque Isotopes at beautiful AutoZone Park. We've sold more than 100 tickets so far and would love to see even more of our loyal supporters there! We've got a limited number of discounted tickets still available, but time's running out. For $10, you can get a Field Box Seat (normally $13) and help support the missions and visions of The Arc of the Mid-South.We'll be in the courtyard before the game passing out information and The Arc of the Mid-South will be featured at times throughout the game on the scoreboard. It'll be a great evening of fun, baseball, and raising funds and awareness for people in the Mid-South with disabilities. We've got additional information about the event on our website. To purchase your discounted tickets, please call Jenny Buchanan at (901) 327-2473 x406 or send her an email at jbuchanan@arcmidsouth.net.